Home to an astounding 7,000 marine species, or 3.5% of the planet's total aquatic life, Costa Rica's incredible biodiversity attracts underwater explorers from all corners of the world! Whether you prefer to kayak in the ocean or relax and soak up the sun on board a yacht, The Real Deal Tours has the perfect Maneul Antonio snorkeling tour for you! The central Pacific underwater world is known more for its diverse marine life and volcanic formations than for its coral. The best places for snorkeling in Manuel Antonio are around Las Gemelas (The Twins), rock formations just 15 minutes by boat from Quepos. White tip reef sharks, sea turtles, spotted eagle rays, seahorses and parrot fish are just a few of the species likely to be observed on any given day. Water temperatures average about 82°F, and visibility oftentimes exceeds 100 feet depending upon the weather and season. The best time of year for snorkeling in Manuel Antonio is from November - April when there is less rain and crystal clear waters. Below we have compiled a list of Snorkeling Tours in Manuel Antonio & Quepos. 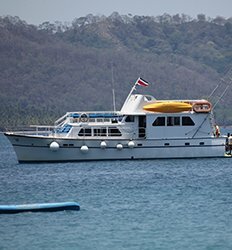 From Catamarans to kayaks in Manuel Antonio to large yachts to Tortuga Island in the Gulf of Nicoya, choose the best snorkeling tour in Manuel Antonio to suit your taste. Our nature and sunset boat cruises are the best way to explore the stunning beauty and biodiversity of Manuel Antonio! 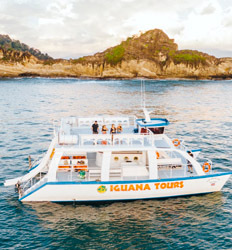 With morning and afternoon departures from Jaco, Quepos & Uvita, you will board our double decker catamaran to take amazing boat tour with some of the most incredible views in Costa Rica. Manuel Antonio Catamaran Snorkel deposit is $15.00 per person departing from Quepos & Manuel Antonio and $20.00 per person departing from: Los Sueños, Herradura, Jaco, Esterillos, Uvita, Costa Ballena & Dominical. 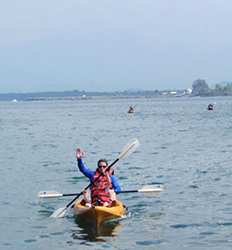 Whether you are a beginner or experienced kayaker, travelling solo, as a couple, in family or group; our Manuel Antonio Sea Kayak & Snorkel Tour is sure to be the highlight of your Costa Rica vacation! Don't forget to look up on occasion; dolphins love to play along this coastline too! This tour option is "Departing from San Jose in Low Season", for more options see details. Tortuga Island Boat Tour deposit is $25.00 per Adult and $10.00 per Child.